Malu Tansey, PhD, aims to neutralize the effects of neuro-inflammation in diseases such as Parkinson's. Emory scientists will collaborate on Parkinson’s disease research supported by a Therapeutic Development Initiative (TDI) grant from the Michael J. Fox Foundation to FPRT Bio, a privately held clinical stage biopharmaceutical company. 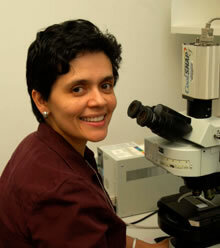 The Emory research will be led by Malu Tansey, PhD, associate professor of physiology at Emory University School of Medicine. Her research team includes postdoctoral fellow Christopher J. Barnum, PhD. Tansey is a leader in studying the role of neuro-inflammation in neurodegenerative diseases. The TDI award, focused on the molecule XPro1595, is the latest in a series of grants supporting Tansey’s laboratory in the development of therapies aimed at treating Parkinson’s disease. "The Michael J. Fox Foundation was one of the first to recognize the importance of chronic neuro-inflammation in the pathophysiology of Parkinson’s disease," says Tansey, "and their support has been essential in the development of this promising therapeutic strategy." Tansey’s research is focused on tumor necrosis factor (TNF), a substance implicated in causing chronic neuro-inflammation and nerve death, the hallmarks of neurodegenerative diseases such as Parkinson’s disease. The FPRT Bio molecule XPro1595 has been found to neutralize TNF and thus could potentially prevent chronic inflammation and nerve death. Because XPro159 selectively inhibits TNF, its effects on the central nervous system (CNS) differ from that of currently approved non-selective TNF inhibitors. In addition to its anti-inflammatory effects, XPro1595 has been shown in the laboratory and pre-clinical studies to promote nerve cell survival and remyelination and to increase central nervous system plasticity. This disease modifying therapy could be effective in treating any neurologic disease where chronic neuro-inflammation and nerve cell death are part of the core pathology, including ALS, multiple sclerosis, Alzheimer’s disease and Parkinson’s disease. "The support of the Michael J. Fox Foundation highlights the potential of this novel therapeutic strategy in the treatment of Parkinson’s Disease," says R.J. Tesi, MD, CEO of FPRT Bio. "Because safety pharmacology and toxicology testing is complete, and a large scale GMP manufacturing process has been established, we can quickly transition into the clinic." FPRT Bio will be presenting at the Biotech Showcase 2013 in San Francisco on Jan. 7 and 8, 2013. Dr. Tansey is a co-inventor on DN-TNF patents.